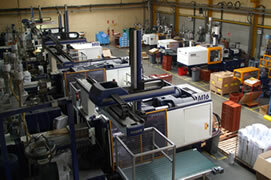 Schoutteten & Froidure has integrated plastic injection and overmolding. We design injection molds internally thanks to our two mold makers. This is a real bonus for customers because we offer you a turnkey solution from the design of the mold to the injection molding of the first items. We have modern equipment to help at every stage such as rheology software, a 3D printer and even a 5-axis machining center for grainage, leather-look, and other finishes. Our injection division is made up of around thirty 20-ton to 1000-ton presses, a clean room, a spraying room, an assembly workshop, and verticle overmolding presses. Overmolding is the process of injecting plastic directly onto a textile support such as a strap or an elastic. This allows a buckle and a seam to be replaced at the same time as improving the finish. Contact us to learn more about our range or future developments.